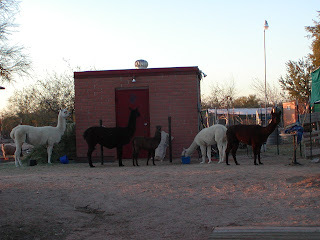 As I walked out to feed this evening, I found all of the llamas and alpacas waiting for me. 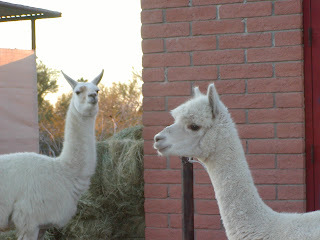 Can you tell which is the llama and which is the alpaca? Jennifer has settled in and does not mind the sheep at all. Geoffrey still keeps his distance, but knows that he better get in the gate when the others do or he will have to wait till I am done feeding. These are Mounds and Musketeer. 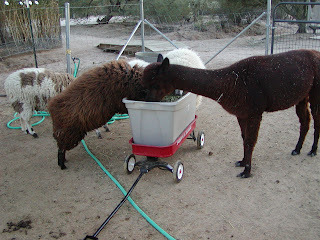 They are Rambouillet/Columbia crosses and they sound the alarm when they see me coming. They have bottomless pits for stomachs. 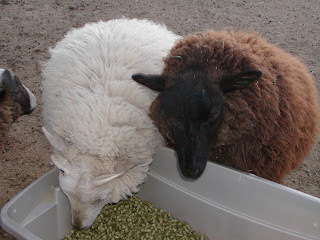 These two wethers are from the Black Border Leicester/Shetland cross ewe. The are 3/4 Shetland and have the best wool of the bunch. They are really friendly when it is dinnertime. 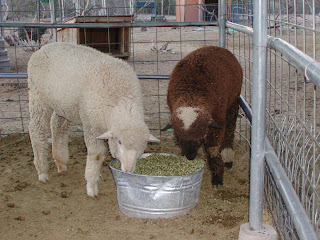 They know that I only feed the pellets to the animals in pens for breeding, so they grab what they can. They let me check out their wool and I can play with their noses. Some of the others do also, but these are the most persistent. They would make great pets. They are for sale - I can't send them to auction.